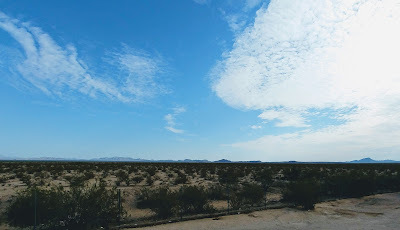 During this sabbatical journey I've been contemplating ways in which the future ministries of our churches -- and we ourselves -- are rooted in past events and personages. As part of this journey I spent four days in Nashville at the Disciples of Christ Historical Society, checking out the papers of my predecessor of some years back, the founding pastor of the congregation I now serve -- Edgar DeWitt Jones. The desk at which I'm sitting in the picture above belonged to this illustrious preacher of the first half of the twentieth century. 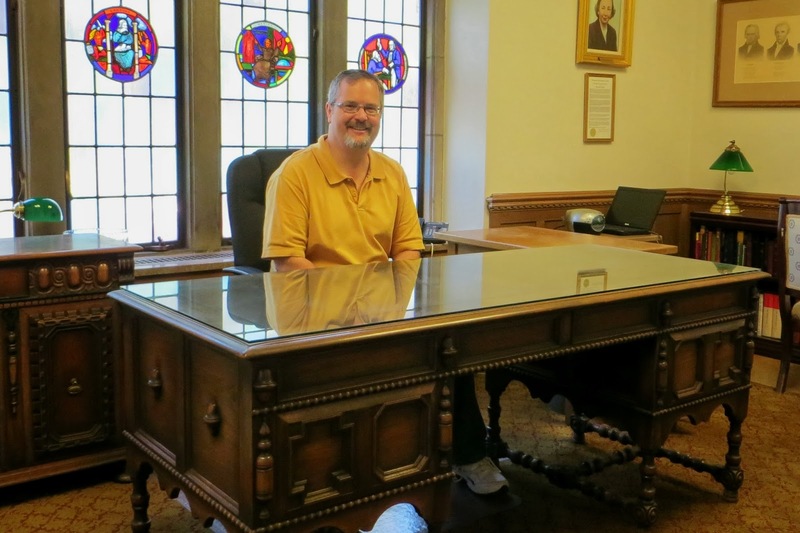 It is now the desk of the Historical Society's president, Dr. Glenn Thomas Carson. It came to the Historical Society by way of the famous preacher's son, Willis, who was the Society's president in the 1960s. When I made my arrangements for the trip I asked Glenn if I could have my picture taken sitting at the desk -- so that I share in its aura. Now, I don't pretend to be Edgar DeWitt Jones. He was gifted for large church ministry, I don't think I am. He was much more eloquent than am I. Besides, he came up in a different era. But, my current ministry is shaped by his ministry. 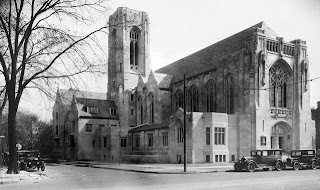 Even though Central Woodward Christian Church today is a very different entity than the church he founded, the very fact that we continue to bear that name even though we reside in a different community -- and don't live on Woodward Avenue -- doesn't mean that elements don't live on. For instance -- preaching and music continue to be important to this congregation. Another legacy that has been passed on, though it takes on a different visage, is concern for the broader community. In reading through correspondence from the first six months of 1922, a difficult period for both church and preacher, I could see this come through Jones's letters. I am fond of Central Church. I think it has an extraordinary opportunity, but it cannot rest upon its oars. It must go forward or it will go back. We are having splendid audiences and a fine interest, but we cannot remain in our present quarters and mark time. I have no regrets on presenting my ultimatum, for it gives the Church an opportunity to decide what it wants to do. . . . I have no anxieties or fears of the future. I acted in this particular matter out of very careful consideration and confided in no one, and walked alone with my conscience and the Great Companion. Of course, if our Church does not go on it will be obliged to go back, but there are some people who will never be satisfied with going back, you may be sure of that. I am having a great time. We are all busy and enjoying ourselves despite the cramped quarters. [letter to Mr.Chars. W. Dunscomb, Feb. 6, 1922, DCHS, Edgar DeWitt Jones Papers]. needed a significant Disciples presence. It wasn't just vanity -- it was a sense of witness. I'll be writing more on this later, but it's important to understand that at the time buildings offered a witness of presence. The ultimate choice of a neo-Gothic cathedral represents this value. But it's important to point out that while the building had the steadfastness of stone, Jones didn't believe that the church should be content with resting on its oars. Unfortunately, by the 1960s, the church had begun to this very thing. It had begun to rest on the legacy that Jones built. Though not the only reason for decline (changing demographics also contributed), the church had begun to embrace traditionalism (not tradition, mind you, but the traditionalism that Jaroslav Pelikan called the "dead faith of the living."). In reaching back into the past, taking hold of a legacy passed down, we mustn't rest on our oars and content ourselves with traditionalism. If we can embrace this caution, then we can embrace a legacy that offers guidance for the future. More on this to come!! The pocket handkerchief does NOT go with those drapes.